Most of us have countless logins, account numbers, passwords, software activation keys, answers to security questions, serial numbers and other types of highly sensitive data. My ID HUB service is a safe place to keep it and make it available to you at anywhere in the world from any device. All you need is a modern web browser. There is no need to download and install any extensions or plugins. My ID HUB service is completely clean of 3rd party services. There are no ads shown on the same pages with your sensitive data, no user tracking software, no integration with social networks, no popups, hidden links or malware. Best industry practices are applied to secure connection between your browser and My ID HUB servers. Service does not accept non-encrypted traffic and automatically redirects web browser to HTTPS protocol. We took extra steps to improve web site experience by presenting an Extended Validation SSL certificate to the browser. This certificate confirms the identity of the web site and company that it was issued to. Your browsers turns address bar green to indicate that connection can be trusted. 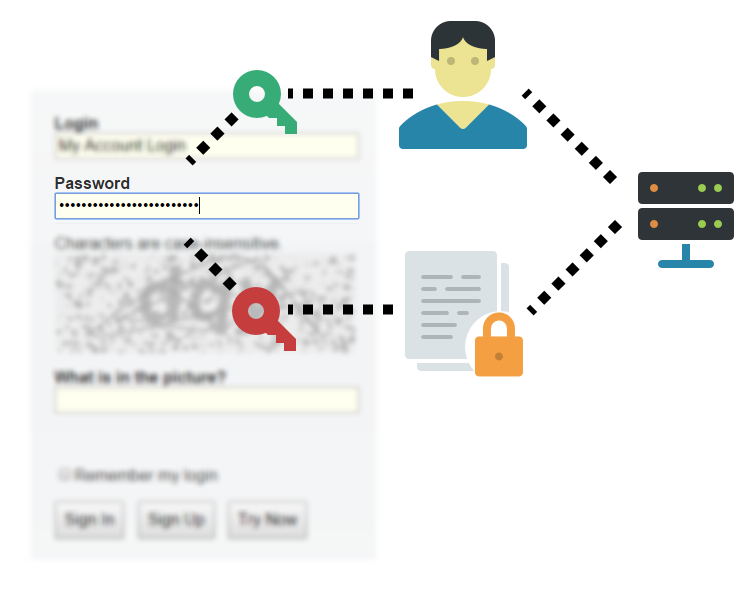 Knowing account login and password may not be enough to gain access to data due to multiple layers of defence built into My ID HUB service. Firewall can be enable per individual account and restrict access to a small list of countries that account owner visits regularly. Every country not in that list will not be allowed to login, even with valid credentials. My ID HUB supports pairing your account with Authenticator app on your smartphone or tablet. 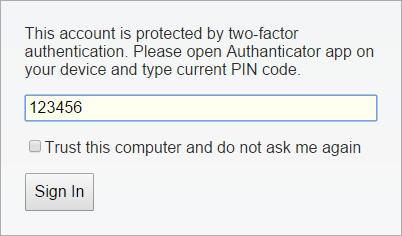 To successfully login into account after clearing firewall check and providing correct login and password one must submit correct second factor authentication PIN generated by paired handheld device. There are a few more security features that work behind the covers to prevent brute-force attack on your account, such as CAPTCHA prompt after a few invalid password attempts and Denial of Service guard. Your My ID HUB account password never leaves your browser. Once you click "Sign In" or "Sign Up" buttons, 2 completely separate cryptographically strong keys are derived from it and original value is discarded. One key (so called authentication key) is used to confirm your identity and allow access to your account, the other (encryption key) is used to encrypt and decrypt data stored inside your account. Authentication key is sent to the server while encryption key is kept in the browser. Both keys are derived from a single password so it is impossible to reset account password without knowing original value. If account password is forgotten, data encrypted with it is unrecoverable. Please make sure you do not lose your account password. My ID HUB service has clean, simple and intuitive interface. It is easy to look-up a password for any website you recorded in your account. 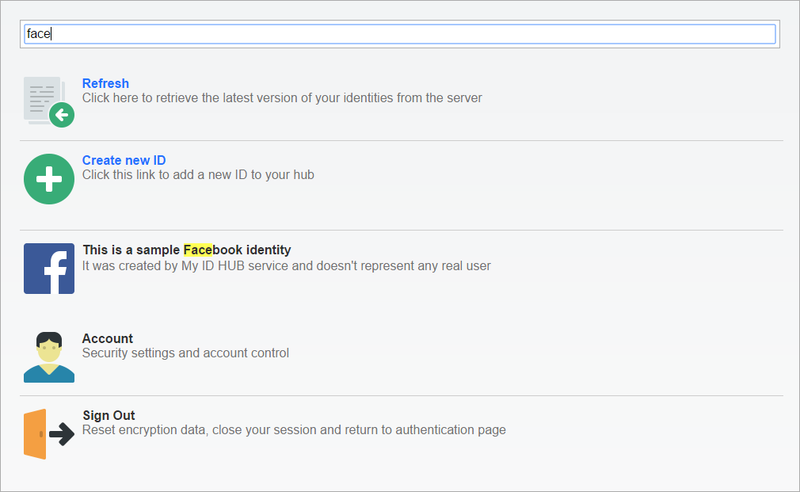 Your identities are automatically classified and are assigned icons based on keywords that My ID HUB service recognizes, for example "facebook" or "netflix". Similar to identities, their properties are also automatically classified into general purpose, login information and passwords (secrets). My ID HUB has a built-in generator that produces strong hard-to-crack passwords which you don't need to remember because they are kept in your account. You own your data in your account so My ID HUB service provides mechanisms to protect it with layers of authentication, transfer it in and out of the system and finally destroy it. 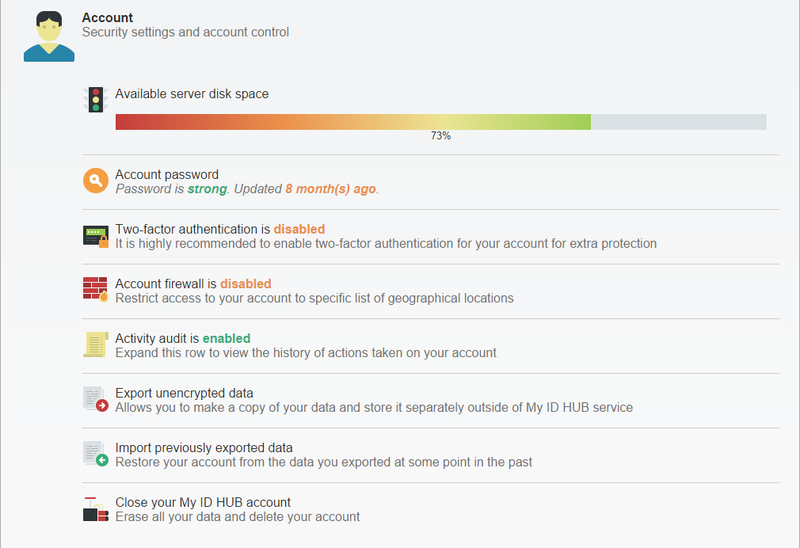 One of the powerful tools available in My ID HUB service is ability to look back at the history of account activity and understand when data was changed, when security settings were updated or who attempted to access your account and failed. 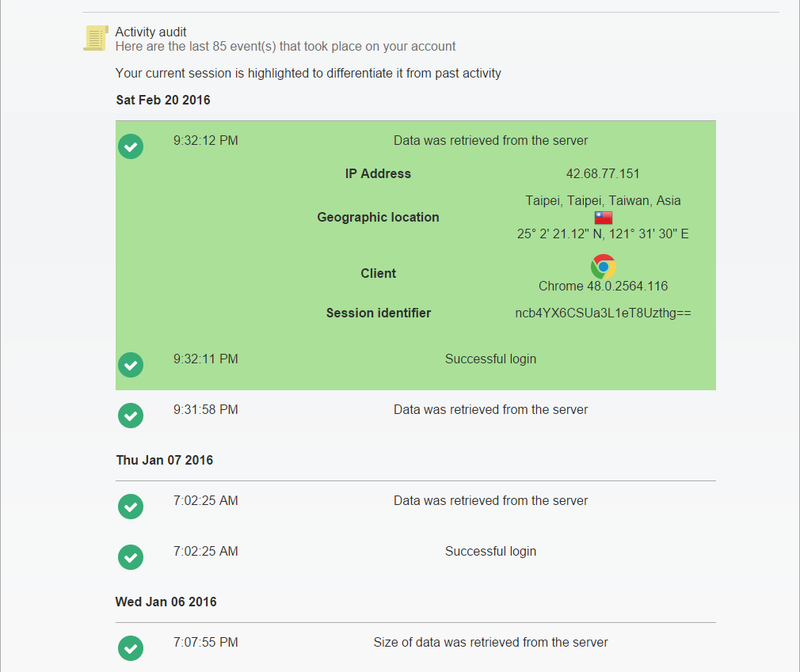 Each record contains IP address and geographic coordinates for intrusion detection purposes. 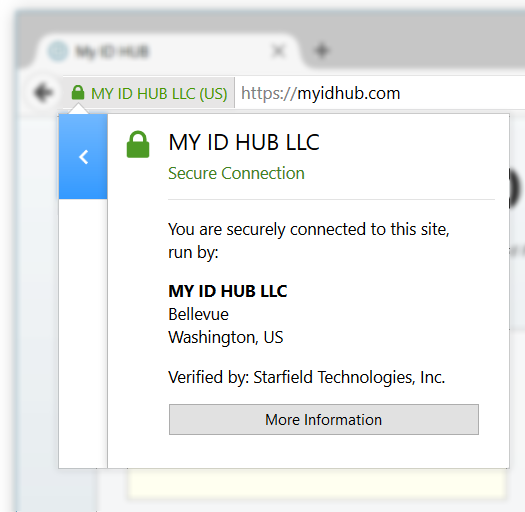 My ID HUB service is available everywhere and can be accessed via most popular web browsers. It is also available as a universal app on Windows Phone 8.1 and higher and Windows 10.